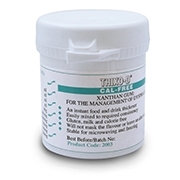 Thixo-D Cal Free is Xanthan gum based and is designed to rapidly thicken most liquids and foods such as pureed apple, mashed potato, tea, coffee, fruit juices, soups, sauces etc. without masking the flavour or leaving an aftertaste. Thixo-D Cal Free is ideally suited for the diets of those with swallowing difficulties (Dysphagia). It is also so ideal for those on the Ketogenic Diet or other carbohydrate free diets as Thixo-D Cal Free is calorie, carbohydrate and gluten free. Thixo-D Cal Free can be mixed easily to the required consistency and is not affected by heat or pH-value meaning it remains stable even after microwaving and freezing. It is also approved by the Vegetarian Society and is suitable for vegetarians and vegans. Thixo-D Cal Free is proudly manufactured in the United Kingdom.